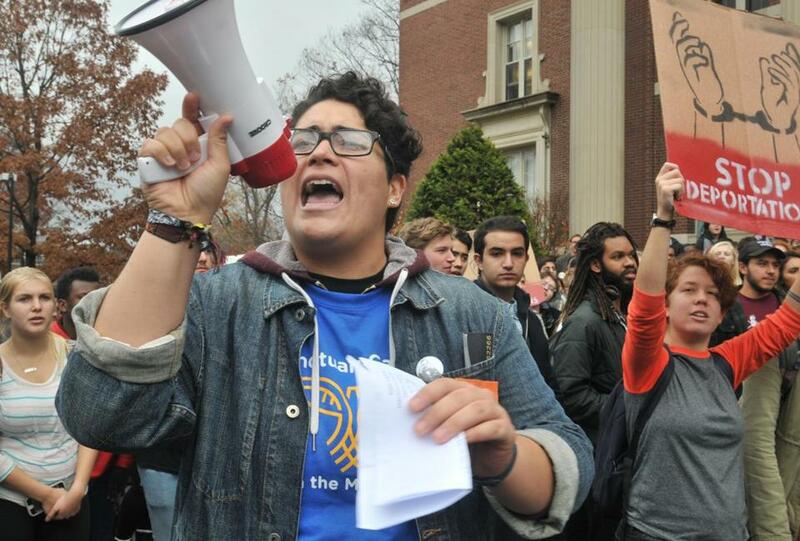 Amherst College student Ana Ascencio lead a chant during a student organized walk out protesting the immigration policies proposed by president-elect Donald Trump. AMHERST — More than 1,000 Massachusetts college students joined those on campuses around the country Wednesday in rallies against anti-immigration policies articulated by President-elect Donald Trump, demanding that their schools adopt policies and practices that would protect students from being deported. Similar protests were held at Amherst College, Mount Holyoke College, and Tufts University, among others. The actions were part of a wave of rallies across the nation since Trump’s election. At UMass Amherst, Canan Cevik, president of the college’s Graduate Student Senate, told the crowd she felt the election deeply, being a woman of color from a Muslim family. Josh Odem, a student representative to the UMass Board of Trustees, said he and other student trustees from the other UMass campuses had a conference call with Martin Meehan, president of the UMass system, asking that all of the campuses be declared a “sanctuary system.” Odem said that Meehan was receptive to the request, but that it would need to be endorsed by trustees. Ed Blaguszewski, spokesman for Umass Amherst, said the school will work to maintain a safe and welcoming environment for students, regardless of immigration status. At Amherst College, about 600 students walked out of classes to join a noon protest. Some faculty took part and canceled classes at the elite liberal arts college. Student Bryan Torres told the crowd gathered in front of the main administration building that as an undocumented immigrant his childhood was marked by a fear of deportation. He was able to obtain a driver’s license, work permit, and Social Security number under temporary federal protection known as Deferred Action for Childhood Arrivals. But many immigrants fear Trump will revoke those protections. In a letter to college president Carolyn “Biddy” Martin, students called on the school to refuse to cooperate with any efforts to remove students from campus and to renew its commitment to need-blind admissions. Standing at the edge of the crowd, senior Joshua Young from Colorado said he showed up out of concern for students who feel newly vulnerable. Laurie Loisel can be reached at laurieloisel@gmail.com.